I finished my Seraphim shawl in record time – only 2 weeks from start to finish! I had the perfect opportunity to wear it Tuesday night as Dale and I were going to give a talk on Civil War reenacting at a local library. I insisted that we squeeze in a photo session before we left the house. Here’s a smirk only a husband can appreciate. 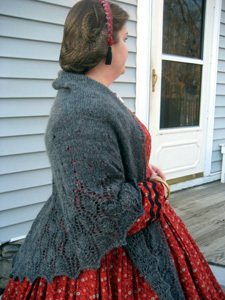 While I don’t intend for this shawl to be exclusively for reenacting, I do think it goes very well with my red day dress. And because I know someone will ask, no I did not make this dress myself. My dear friend Wendy made it for me. I did put on the trim, though. The yarn, as you may recall, is my handspun from an Indigo Moon blend of merino, silk and alpaca. I knit one less pattern repeat than called for as I was worried that I would run out of yarn – and I would have. 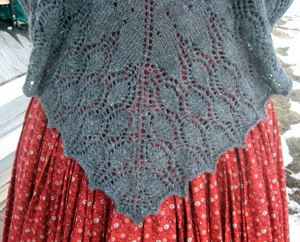 But the shawl is plenty big as it is so I’m not sorry about making it a wee bit smaller. The stockinette portion went very quickly and the lace charts are easy to follow and make a really beautiful pattern all along the edge of the shawl. 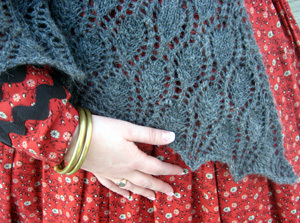 Miriam is an excellent designer and this shawl is just one of many gorgeous patterns available on her web site. Just sayin’. I really love the way it comes together at the point in the back. It’s very warm and very soft and very cozy. I spun it myself and I knit it myself and I absolutely love it! I NEVER comment on posts with this many comments, but your pictures are so stunning that I had to. You look so authentic in that dress and shawl that it is eerie. Are you sure you weren’t a Union wife in a previous life? You look absolutely beautiful. I know you say that you don’t mean for the shawl to always be a part of your reenactment clothing, but I do love the idea that a handknit item, as it would have been created in the past, is a part of your outfit. You could seriously have a little Civil War era knitting group and make socks for the soldiers. I can’t add anything else, other than BRAVO!!! I’m in awe. As good as it gets. Five stars. DD’s studying the Civil War at school right now, so seeing you in your reenactment clothing is a real treat for her. Your shawl is beautiful. I love the whole ensemble, it goes with that dress perfectly. Also – I made your stroganof recipe last night – and now my pants don’t fit. That is my absolute highest compliment! 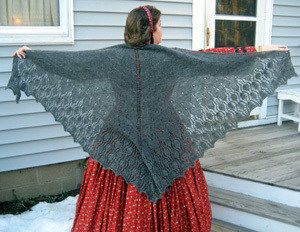 Your Seraphim shawl is beautiful! It looks REALLY soft and warm, too. Oh Carole, that is beautiful! I can’t believe you knit that in only 2 weeks. That’s amazing. It makes it all the better that is made from handspun too. 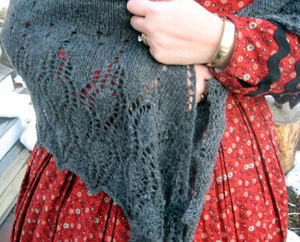 Just gorgeous – congratulations on a wonderful shawl (spin & knit) !!! It is nothing short of remarkable. Congratulations on such a gorgeous culmination of such an impressive amount of work. Fantastic. Just fantastic. I can only imagine the looks on someone’s face when you tell them that you spun AND knit it yourself. Great Shawl! Looks wonderful on you too. Beautiful shawl and great get-up, and you spun the yarn, too!!!? Gorgeous. That’s one of the nicer shawl patterns I’ve seen. Not too lacy. Not too plain. Just right. Your shawl is simply beautiful and really finishes off the dress. The Seraphim is breathtaking, and really does go beautifully with the red dress. But, I must know … how many yards of fabric are in that dress? Miz Carole, you look fetching in your new shawl! I have that pattern waiting for me to knit it, this is pure inspiration. You look great in that shade of red, btw. Oh, wow! Fabulous! 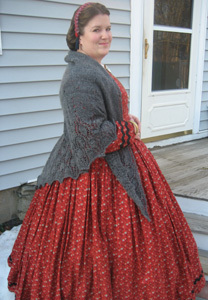 the shawl looks amazing, you look amazing in the dress, too – brava, dearie! oh carol it’s beautiful—and you look just adorable in it with the red dress. That is a lovely shawl. Nice dress, too. Amazing! You did a fantastic job and I’m still amazed at it only taking 2 weeks. Gulp! Oh that dress is sooo cool too. This is the most beautiful shawl ever! And it looks fab over your gown. The pattern, colour and size – all just great! You’re making the kind of stuff I’m aspiring to do, as long as I can make it through all the beginners’ stuff first! Wow – what a boost and kick of inspiration you gave me! Thanks. oh..so wonderful… you’ve knitted it really wonderful…. compliment! Beautiful shawl and it does look nice with the red dress!